in an enchanting way by nature. And its ambiance display sheer excellence. 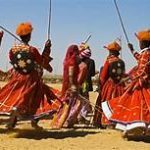 After getting soaked in the colours of the famous Desert festival of Jaisalmer, we set out for experiencing the charm of sand dunes at Sam Sand Dunes, which is around 45 km from Jaisalmer. We were really excited to go for a camel safari at Sam Sand Dunes. We reached there in the evening around 3 pm. The sight of the sand dunes moving dramatically on the rhythm of wind is a treat to the eyes. The very thought of being in the desert under the star-studded sky was overwhelming. I was ready to ride on a camel named Jhumroo. I loved his name. Jhumroo’s owner Rajpal was quite talkative and really entertained me through his interesting stories on the safari. Merging with the colours of the dusk, the sand dunes were looking mind blowing. I captured the rustic beauty of the sand dunes in my camera. We passed by a bunch of chattering women who were dressed in colourful attires. I stopped there and requested them to pose for a photograph and it seemed as if their happiness knew no bounds. Their faces were brimming with joy. We were scheduled to stay in the tent accommodation. After reaching at out tents we spent most of the time capturing the beauty of the desert in our hearts. The sunset view at the Sam Sand Dunes was out of this world. 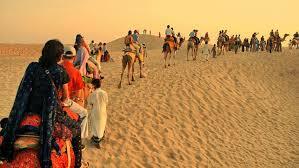 The cultural programmes in the evening at the sand dunes added more charm to the awesome ambiance of the sand dunes. Dining at the sand dunes was an amazing experience. After having dinner we went off to sleep under the star-studded sky, on the unfathomable sand dunes. Truly an overwhelming experience! 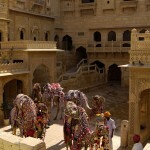 «Next Post Jaisalmer Desert Festival-When The Desert Comes Alive!